Sunrise overlooking the Garden of the Gods, December 2013. Last year, I wrote a song about winter–winter as a metaphor for overcoming adversity. I recorded the song in the fall, with Gina Rose as lead singer, at Mace’s Hole recording studio in Beulah, Colorado. Here is a list and brief description of the scenes in the video, in order of appearance. Time lapses generally ran from a few minutes to an hour–the toughest part was trying to stay warm during the lapses! 1) Maroon Bells, Aspen, Colorado. I wrote about this trip in my blog post in November. 2) Crater Lake, Maroon Bells, Aspen. While I was shooting this sequence, an older couple walked by on snowshoes, and we had a discussion about time lapse–Robert Fricke and his films. 3) West Maroon Creek, and the Bells (Aspen). As a meteorologist, I love the way time lapse really shows you wind motion and the fluid nature of air. This was taken he same afternoon as the first sequences–thanks to the low dynamic range of afternoon light–the tough shots were yet to come! 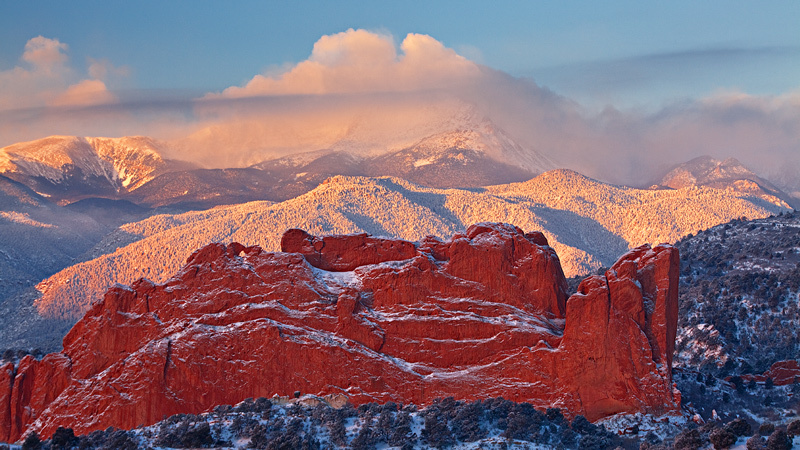 4) Garden of the Gods, Colorado Springs. I was the only one in this popular park this morning–the temperature was well below zero and it was after a fresh snowfall that made the windy narrow roads in the park quite a challenging drive with my 2WD Focus! 5) Monarch Pass. A surprise snow squall hit as I headed east over the pass–and I barely made it over! I pulled over near the summit to shoot this video of the snow. 6) Garden of the Gods, Colorado Springs. The classic overlook shot at sunrise. I was joined by a couple other photographers, including my good friend Todd Caudle. If I recall, the temperature was ten below zero Fahrenheit–so it was a chilly wait! to experience the steam fog that rises over the relatively warm lake. All of my Lake Pueblo shots were taken on one very cold (subzero) morning, on the north shore of the lake. 8) Paint Mines Interpretive Park, Calhan. I found this frozen pond on a short hike in the park, and shot the rising full moon. 10) Arkansas River, Swallows. About a one mile hike to the river. Large chunks of ice flowed downstream, and at one point, a couple beavers (otters?) floated by in the current–unfortunately they must have blurred out in the long exposures here. 11) Arkansas River, Five Points. Part of the recreation area upstream of Canon City. Another bitter cod morning. 12) Barr Trail, Pikes Peak. I hiked a couple miles up trail this foggy March morning after a fresh light snowfall. As I descended I dodged trail runners headed uphill. The toughest part was walking back down Ruxton Ave on the icy streets back to my car. 13) Rocky Mountain National Park, Lily Lake. Bear Lake road was blocked by five foot snow drifts, so I headed to Lily Lake and hid behind a tree to shelter myself from the 70 mph winds. It was fascinating watching snow blow across the frozen lake. 14) Green Mountain Falls. A couple short videos of the frozen cascades coming down the east side of Pikes Peak. I cut my hand after slipping on the icy trail to the falls–fortunately there was plenty of icy water to clean the wound! 15) Green Mountain Falls, Crystal Falls in early winter. 16) Rocky Mountain National Park. I shot this the evening before #13, when the Bear Lake road was still clear of drifts–but the wind was still howling! I trudged through a couple feet of snow to set up my tripod to catch this windy sunset from Moraine Park. 17) Lake Pueblo, steam fog. 18) Siamese Twins, Garden of the Gods. Same spot as #9, this time at sunrise. 19) Maysville. Coming down from Monarch Pass, I pulled over to shoot some video of the clearing snow storm. 20) Black Canyon of the Gunnison National Park. View at sunset from Rock Point, a couple miles up the (closed in winter) south rim road. 21) Black Canyon, a few minutes later–the moonrise. Nothing but coyotes keeping me company. 22) Two sequences of the rising moon shot from my house in Pueblo West. 24) Barr Trail, Pikes Peak fog. 25) Red Rock Park, Canon City. The growing night from this hidden gem in Fremont County. 26) Tomichi Point, Black Canyon of the Gunnison. The sunrise after scene #20. 27) Sun dog, Fountain, Colorado. If you have super clear and fast vision, you can spot a formation of geese flying across the sun dog at the very start of this time lapse on this icy morning. 28) Lake Pueblo steam fog. 29) Lily Lake sunrise, Rocky Mountain NP. 30) McMillan Peak, Red Mountain Pass. I shot this sequence coming down from a steep climb up the 12,800 foot peak on the side of the famed highway that connects Montrose to Durango. This is a popular back-country ski spot, with a remote ski lodge in the heart of the San Juan Mountains. 32) Ice cave, Rifle. Details in my previous blog article. 33) Snowstorm, Gateway Rock, Garden of the Gods. 34) Blue Mesa Lake, Sapinero, in the process of freezing. 35) Garden of the Gods. It was snowing one inch per hour this day. 36) Final video of the Three Graces, Garden of the Gods. I hope you enjoyed the song and video! Next up–Storm Chase season!! Hey, Raj–good to hear from you! Thanks! This is incredible. I LOVE the song with the video. Just wonderful. I envy your technical and artistic skill with photography. You have a great depth within yourself. What a gift for you and all of us. Thanks for your kind words, Linda! Much appreciated.